Tie down the tinsel… here comes a big one! Brief update on storm “Caspar” (our own name, middle one of Three Kings ): possibly worst in 130 years for UK (BBC source). WIND: Reigate can expect possible gusts of 50-60mph, though the town itself is sheltered from southerly and SW winds by Priory Park hill and woodland so that we can shave off 20% from max wind gusts, usually. 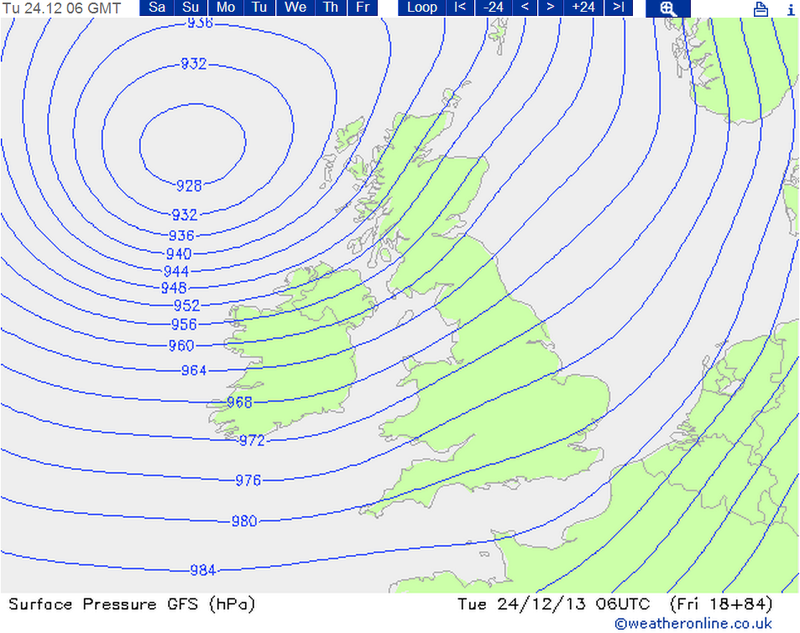 The max quoted gust from UKMO is 66mph in small hours of Tues am as cold front goes through. StJude, the last big storm in October, had a max gust in town of 48mph during high winds that lasted only a few hours. Caspar is set to be a longer duration, across a wider part of the country and is a bigger beast, the storm being centred off the NW of Scotland, rather than running through the Midlands like StJude. Winds will spring up early tomorrow and by 11am could be gusting at 50mph. They remain strong for the next 12 hours, peaking as the cold front arrives overnight/early morning Tuesday. 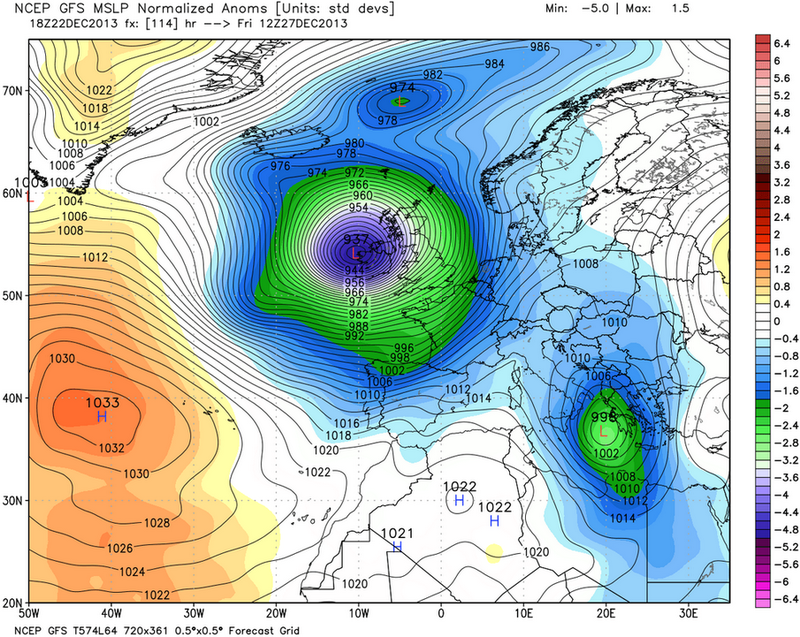 The emerging storm is now visible in the Atlantic as a familiar hook shape develops with cold and warm fronts. 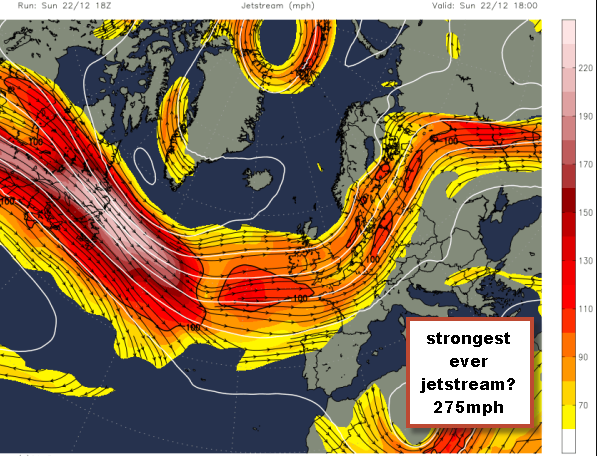 The storm is set to explode over the next 24 hours in a process called cyclogenesis, caused by a very powerful 270mph jetstream “sucking” air off the ground as air diverges aloft. This lowering of pressure by some 50mb in a few hours will cause air to “rush” into the “void” (converge) and this, in a simple way, is the cause of the maelstrom. The spin of the Earth causes the winds to rotate into the centre of the Low pressure in a process called coriolis effect. RAIN: Reigate can expect almost continuous rain for 12 hours, starting early Monday morning, around 6am, through to around the same time on Tuesday. Heavy rain is caused as air rises, cools and condenses especially where warm air is forced to rise over cooler polar air. This will happen especially at two moments as the storm passes… first the warm front and then a cold front (overnight, probably Tuesday early am). They have different characteristics. 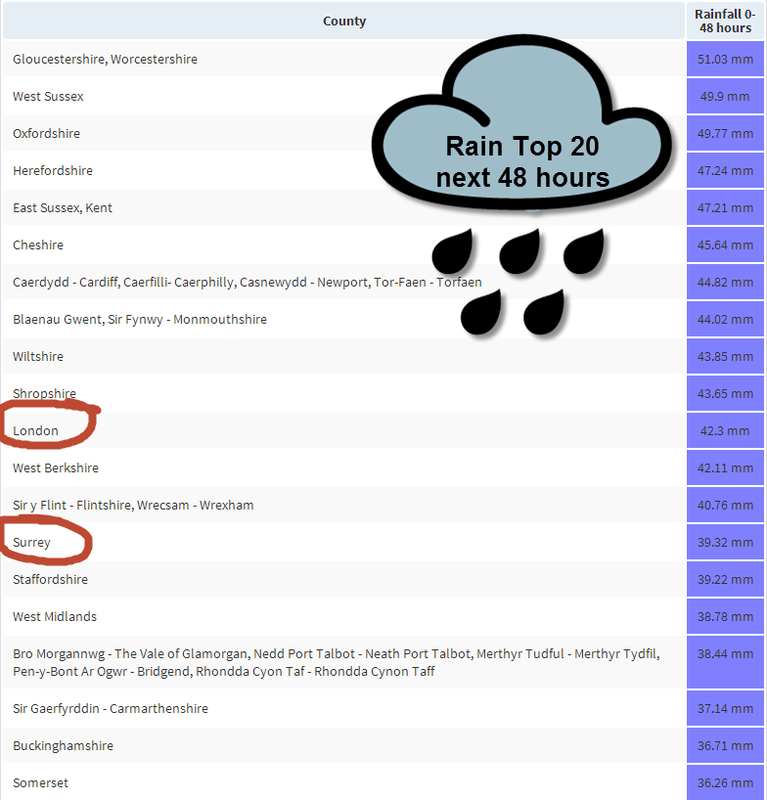 Of most concern to us and the Environment Agency tomorrow, is that this storm will be causing more or less non-stop rain from 9am Monday through to about the same time Tuesday. Rainfall totals 20-30mm can be expected during the course of the storm and, on saturated ground, this will cause flooding and plenty of surface water on roads. The “good thing” is that cold fronts pass pretty quickly and moderated wind conditions arrive soon thereafter, this means Tuesday is likely to see brightening ameliorating conditions arrive during the morning for any clear up. Flooding will be a problem by then and it’s likely that our River Mole will flood key back-routes and surface water on more major roads could be a problem. Winds of more than 50mph can also causes trees to be knocked down and other damage is possible. Finally, waves in the Atlantic are expected to reach near “phenomenal” heights with significant wave heights of 13m by Christmas Eve (which means waves double this height could occur once an hour). give us a wave, big one! After a quieter rest over Christmas things sadly don’t get a lot better… another storm is heading our way for Friday and the weekend.